Elite Stat: Matt Ryan had an adjusted completion percentage of 77.8 percent this week. In a game that came down to the wire on Monday night, Matt Ryan continued his 2017 resurgence after a slow start to the season. He was kept clean most of the game, but he had a passer rating of 145.8 on the few snaps he was pressured. With two drops from Falcons receivers, he had an adjusted completion rate of 77.8 percent and barely put a foot wrong all game. Elite Stat: Marshawn Lynch had an elusive rating of 100.0, breaking four tackles in 12 touches. Marshawn Lynch looked like the old Beast Mode against the New England Patriots, at least as long as the Oakland Raiders handed him the football before they began to chase the game and he was marginalized. Lynch gained 6.1 yards per carry, with 33 of his 67 yards coming after contact, breaking three tackles and racking up his longest carry of the season with a 25-yard scamper. Elite Stat: Keenan Allen gained 4.97 yards per route run this week. Quarterback wasn’t the only issue for the Buffalo Bills this week, as they were completely unable to contain Keenan Allen of the Chargers. Allen was thrown at 13 times, and he caught 12 balls for 159 yards and a pair of touchdowns. Allen beat seven different Bills defenders in coverage, including their top three corners. When targeting Allen, Chargers quarterback Philip Rivers had a passer rating of 157.2. Elite Stat: Alshon Jeffery gained 2.58 yards per route run this week. Carson Wentz had another strong outing for the Eagles, and his favorite target this week was WR Alshon Jeffery. The former South Carolina standout was thrown at six times, and he came down with four catches for 67 yards and a touchdown. His lone score was a fourth-and-five play that threw a dagger into the Dallas Cowboys on the night and involved an impressive catch from Jeffery in the end zone. Elite Stat: Adam Shaheen gained 2.73 yards per route run this week. The Chicago Bears’ giant rookie tight end caught everything sent his way this week against the Detroit Lions. Adam Shaheen was targeted four times for 41 yards including a touchdown, while Mitchell Trubisky’s overall passer rating was 88.1 when targeting Shaheen it was 149.0. Elite Stat: Alex Collins broke five tackles on 24 touches this week. The raw numbers don’t make for pleasant reading for the Baltimore Ravens’ running game this week against the Green Bay Packers. Alex Collins carried the ball 20 times and gained just 49 yards, but 45 of his 49 yards came after contact, and he was forced to consistently make moves just to gain positive yardage. He also chipped in with four receptions for 22 yards out of the backfield. Elite Stat: Dion Dawkins allowed two total pressures this week against the league’s best pass-rush duo. The Chargers’ pass-rush duo was able to generate huge plays all game long against the Bills, but most of the damage came from the other side of the line against Jordan Mills. At left tackle, Dion Dawkins surrendered just two total pressures against the two best pass-rushers in the league in Joey Bosa and Melvin Ingram on 45 pass blocking snaps. Dawkins also made a few key blocks to spring Buffalo run plays. Elite Stat: Kelechi Osemele allowed no pressures across 50 pass-blocking snaps. Another player that dominated despite the scoreboard going completely against his team, Kelechi Osemene was a beast against the Patriots. He didn’t allow any pressures across 53 pass blocking snaps. He was a force in the run game as well, driving Patriots linemen off the line of scrimmage at will and crushing players when he was on the move. Elite Stat: Cody Whitehair allowed no pressures from 33 pass-blocking snaps. Cody Whitehair gave us a flashback to his dominant rookie outings this past week against the Lions. The Bears were able to dominate at the line of scrimmage and rack up 222 yards on the ground, gaining 79 of them on immediately either side of Whitehair’s block at the point of attack. Whitehair didn’t allow a single pressure in the game and was a big part of that rushing success. Elite Stat: Brandon Scherff allowed one total pressure from 37 pass-blocking snaps. Brandon Scherff did surrender a sack against the New Orleans Saints, but it was the only pressure he gave up all game long across his pass blocking snaps. He was the best blocker on the Washington Redskins’ line in the run game, allowing his team to average 8.6 yards per carry on runs immediately either side of his blocks. Scherff was getting to the second level and putting a punishing on Saints linebackers and safeties all day. Elite Stat: Bobby Massie allowed two total pressures this week. 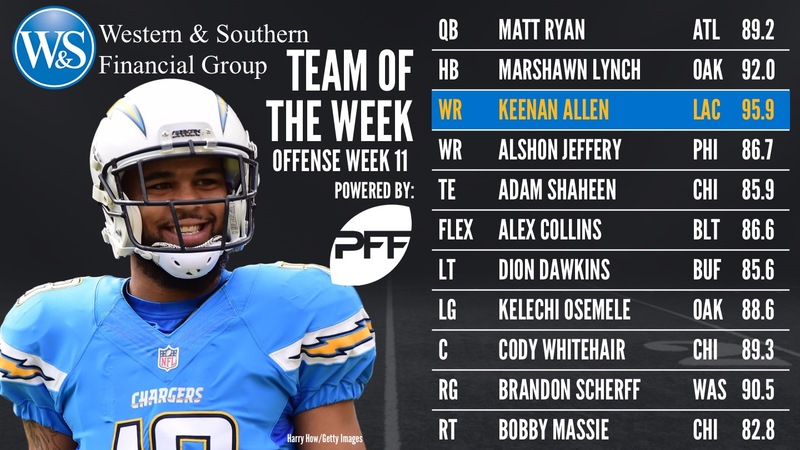 A second member of the Chicago offensive line made the team of the week for their performance against the Lions, while, in truth, four of the five starters could have made it. Bobby Massie allowed just two total pressures (hit, hurry) on his 35 pass blocking snaps, but his standout performances came in the run game where he was able to create movement on down blocks all game long. Elite Stat: Aaron Donald had six total pressures this week. As it is seemingly every week, the first name on defense is that of Aaron Donald, who had another fine game despite his team failing to stop the Minnesota Vikings over the course of the game. Donald had six total pressures and three defensive stops over the course of the game and was too quick and disruptive for Minnesota’s interior linemen to handle. Elite Stat: Gerald McCoy had five pressures against the Dolphins. Gerald McCoy retains his space on the interior of the defensive front on the team of the week with another strong performance. Against the Miami Dolphins, McCoy was able to rack up a sack, two hits and two hurries as well as four total defensive stops. He was the best player on the field across his 53 defensive snaps, which was also ten more than any other Tampa Bay Buccaneers lineman. Elite Stat: Alex Okafor had six total pressures from just 24 pass-rushing snaps. Alex Okafor’s play this season has been a huge boost for the Saints’ defense, but sadly, this is the last time Okafor will have a chance to appear on this list this season having gone down injured. Okafor had six total pressures and seven defensive stops in the game, dominating the blockers tasked with stopping him. Elite Stat: Justin Houston had five total pressures against the Giants. Going up against the New York Giants and the right side of their line will help most pass-rushers get back on track, so it was no surprise to see Justin Houston come out of this game with a big performance. Houston had five total pressures and four defensive stops across 66 total snaps. He graded extremely well against both the run and pass for the Kansas City Chiefs, but it wasn’t enough to help them escape the game with a win. Elite Stat: Vontaze Burfict had a run-stop percentage of 22.2 against the Broncos, best in the league. At his best, Vontaze Burfict is a punishing run defender and there was no greater display of that than this game against the Denver Broncos. He had 11 solo tackles and two assists, coming out of the game with nine defensive stops, the most in the league this week. In addition to all of those stops, Burfict also forced a fumble on RB C.J. Anderson and notched a sack by destroying Devontae Booker in the backfield. Elite Stat: Bobby Wagner allowed five catches for just 26 yards against the Falcons. With the Legion of Boom down most of their number due to injury, it was left to the Seahawks’ front seven to try and pick up the slack on Monday night against the Falcons. Wagner once again led the team in solo tackles and had three defensive stops, as well as picking up a hurry on the blitz from the five snaps the Seahawks rushed him. In coverage, he allowed five receptions, but those catches went for a total of just 26 yards, as he excelled in keeping everything in front of him. Elite Stat: Casey Hayward allowed just one catch from eight targets this past week. Casey Hayward was certainly helped by the failed Nathan Peterman experiment this week, but he has been a shutdown force for the Chargers ever since signing with the team. Hayward was thrown at eight times and allowed just one catch all game, intercepting the ball twice and breaking up another two of the incompletions. When targeting Hayward in this game, Bills quarterbacks had a passer rating of 0.0. Elite Stat: Patrick Robinson allowed 0.53 yards per coverage snap against the Cowboys. Patrick Robinson continued his Pro-Bowl caliber season against the Cowboys this week despite the return of Ronald Darby to the lineup. Robinson was thrown at seven times and gave up just three receptions for 16 yards, breaking up two of the incomplete passes and limiting Cole Beasley to just one catch for three yards when in his coverage. 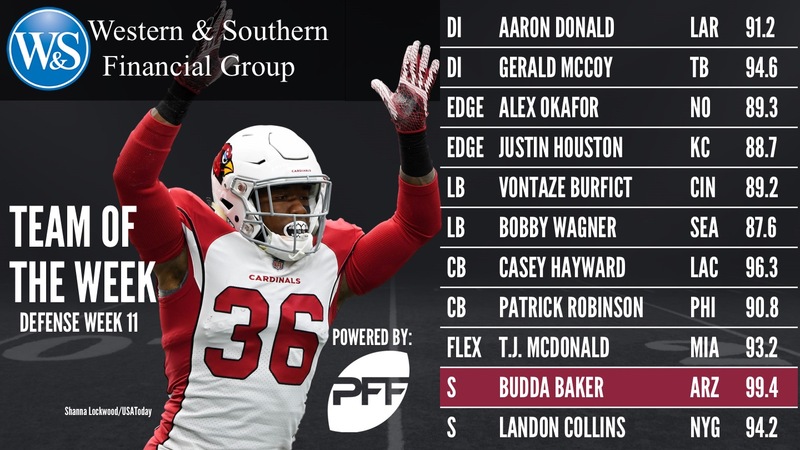 Elite Stat: Budda Baker had a run-stop percentage of 13.0. Budda Baker was a whirling ball of destruction against the Houston Texans’ offense this week for the Arizona Cardinals. He finished the game second on the team with ten solo tackles and also had a sack, a hit, a batted pass and four defensive stops. He appeared all over the field in the finest representation of the do-everything player he was expected to become as a prospect. Elite Stat: Landon Collins run-stop percentage of 13.3. Landon Collins has taken a step backward this season, as has the Giants defense as a whole, but this week he was back to his best against a Chiefs team that has been struggling to get itself on track. Collins led the team with eight solo tackles and six defensive stops, with that latter figure doubling the next-best score on the team. In coverage, Collins also notched an interception and allowed just three yards despite seeing seven targets in primary coverage. Elite Stat: T.J. McDonald run-stop percentage of 25.0. T.J. McDonald ended the game against Tampa Bay with four defensive stops from his four solo tackles, and he was also impressive in coverage when called upon. He was in primary coverage on just two plays, but he broke one of those up and the other went for six yards. This was a performance with simply no mistakes from McDonald. Not only did Stephen Gostkowski go four-for-four on the day, but he was also the only kicker in the NFL to connect on two field goals of 50 yards or longer, one of which was from 61 yards. Continuing another special season for one of the top punters in the NFL, Johnny Hekker was outstanding for the Rams on Sunday. Four of his six punts landed inside the Vikings 20-yard line. A big performance on Monday Night Football sees Tyler Lockett make the team of the week. He averaged 39.4 yards per kick return in the loss to the Atlanta Falcons, with his quick feet forcing a missed tackle in the process. Tyler Matakevich is having a big year on special teams, and was solid once again this week. He registered three tackles, all on kickoffs, taking his solo special teams tackle total on the year to seven.